The saga of the life and times of Lama Thubten Yeshe continues. Compiled by Adele Hulse. The Lamas arrived back at Kopan for the tenth November Course, for which one hundred and eighty students from fourteen different countries had enrolled. The big tent was relocated a little lower down the hill and built into an earth wall. It was a slightly more solid structure than before, but still basically hessian, scrap wood and sheets of tin. It provided no protection against the cold Himalayan winter. There was also the usual army of hungry fleas to contend with. Two recently installed electric pumps delivered water to the top of the hill, though the toilets were still open trenches. Tom Szymansky was a psychology graduate with five years of clinical experience. 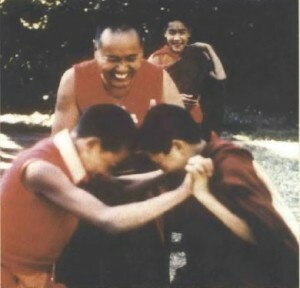 His first encounter with Lama Yeshe was to observe him giving one of the Mount Everest Center (MEC) boys a thorough hiding. “He was smacking him hard with his open hand and the kid was crying and yelling out. I didn’t know who he was and walked over. He spoke to me so kindly: ‘Oh, hello dear.’ Then turned angrily back to the boy, whacked him again, then turned back to me. With utter gentleness he said: ‘He stole from the gompa. If I don’t do this now he will suffer worse later.’ Whack! I was absolutely stunned. I had never seen anybody switch like that from utter wrath to absolute gentleness. He finished beating the boy and sent him off. He said he hoped the experience had not disturbed my mind, but it was necessary. Then he went away. Later I found out that was Lama Yeshe,” said Tom. Tom soon began skipping some of Lama Zopa’s lectures. ”You not in the session?” queried Lama Yeshe, finding him sitting alone one day. “He started talking to me about mundane things, gardening and such, in very ordinary words. There was nothing you could pick but they had the effect of making me realize these strange things Rinpoche was talking about were also everyday things; that the Dharma was a down-to-earth everyday thing in itself. As soon as my mind grasped that, Lama was gone,” said Tom.